After the Howdies we trooped on and off the set in constantly changing threes to do short practice games as a technical run-through, our old friend Glenn playing Alex. This also helped acclimatize ourselves to the dreaded signalling device, as well as the hydraulic boxes behind the podiums that adjusted our heights. (Robert: “Don’t fall off, Suzuki!! !”) I was glad the video screens weren’t any smaller than they were: with my poor acuity it was just on the edge of being okay for me to read without squinting. One contestant’s cute dress was nixed by the floor director because the checkerboard pattern was blowing out the cameras, and she had to go to the green room to change. Too soon, at around 11 am we were herded back to our seats at one side of the auditorium (forbidden to interact with the regular audience), and the first three contestants took their places for the first real game of the day. I was told part-way through the first game that I’d appear on the second show of the day (to air on New Year’s Day 2013). The other new contestant, Andrew, and I drew lots for podium position (the champion always stands at the left-most podium, nearest Alex). I drew podium 3 on the audience’s right, and so would be first to talk with Alex after the first commercial break. After show 1 finished, show 2’s competitors were trooped back to the green room: two-time champion Paula to get de-miked and change outfits; and all three of us to get our lapel mikes and battery packs threaded under our clothes, use the bathroom, and get our makeup touched up. Back to the set, standing on our boxes, a growing feeling of unreality settling over me. The music started; I vaguely heard Johnny Gilbert intone “A graphic designer from Toronto, Canada…” during which I desperately tried to remember which of the two cameras at the opposite side of the set I was supposed to look into. Pretty much what you see on the TV show is what happened on set: The show is largely taped in real time (complete with all the music cues you hear on TV), including commercial break time. The audience was instructed to applaud coming in from certain breaks, but not others (notably Final Jeopardy), which is something I never noticed watching the show on TV. 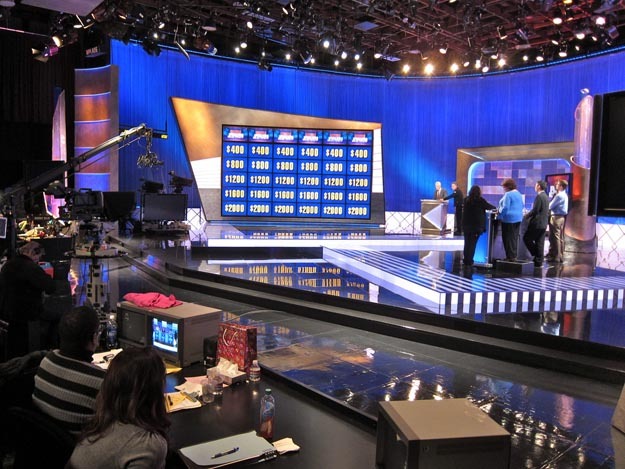 There is one slightly longer break to allow time for the contestants’ Final Jeopardy calculations. I noticed that, close up, Alex also looked rather unnaturally orangish as well. It was not a good show for me. There weren’t any categories that I “owned” (no music, literature or theatre, no science). My impressions? When you play it lying on your couch, it feels like a typical TV half hour. You remember your hits, note the occasional miss and often say “Yeah, I woulda got that”. When you pretend to play as a contestant (as I had been doing the past 5 weeks) it goes noticeably faster: You have no time to dwell on misses, and have periods of brain freeze where you can’t dredge up the answer in the short period you need it. But when you actually are there, playing it for real—with the lights, music and audience—the game goes FAST. We did have a slight pause at Andrew’s Daily Double as the judges debated whether a previous answer of his was correct or not. During this time we three competitors had to turn around on our boxes and face the wall, while Maggie kept us entertained. I did have two “Canadian moments” on the show: First, to my infinite relief, I correctly answered the Canadian question (there’s always at least one per show) with “What is the Governor General?”, prompting Alex to joke that he was glad I managed to get that one. The other involved re-spelling British-spelled words with US spellings, and of course, I would say zed instead of zee! There were several clues which no-one answered (called triple stumpers in Jeopardy! parlance), upon which Alex cracked wise about the three of us having had too good a time at our New Year’s parties last night! Unfortunately that joke got edited out in post-production. Maybe it was deemed too snide, even for Alex. I made up enough ground to not totally humiliate myself, but alas I still finished third at the end of Double Jeopardy ($9000, to Andrew’s $10,100 and Paula’s $11,900). People told me afterwards that I looked very calm and composed (Peter used the word “zen”). I think under the stage lights people freak out in one of two ways: either get all nervy and hyper, or hunker down and go immobile (guess which one I was!) Luckily it made me look competent (apparently) and not comatose. (Although Maggie did tell me during the first commercial break to liven up.) And rest assured, I was furiously clicking the signalling device, even if it doesn’t look like it! Remember, on Jeopardy!, everyone’s smart, but timing is crucial! During the last commercial break the three competitors were told to stand on a series of tape marks on the floor for our last face-to-face with Alex during the credits. When the cameras rolled, Alex started telling us some ridiculous story apropos of absolutely nothing (I think it was about man-eating alligators or something else equally inane) and we dutifully—but animatedly—laughed along with it. So now Paula was a three-day champion and would go on to play her fourth game; and Andrew and I signed our consolation prize forms and were hustled away from the other competitors to get our clothes bags. 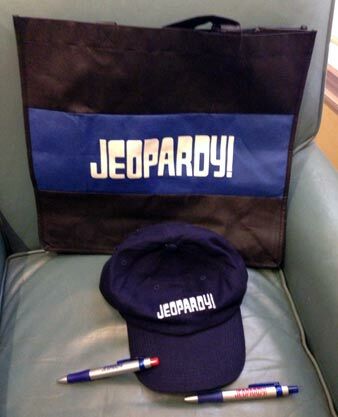 Our only tangible souvenirs for the experience: another pen, and a Jeopardy! carrier bag and baseball cap. The two of us were permitted to watch the third show—with the regular audience only, not with the other contestants—but after that were peremptorily kicked out of the building (along with one of show 3’s losers) to take a cab back to our hotel (on our own nickel, of course). That’s Jeopardy! for you: Effusively friendly at the start; efficiently ruthless at the end. During the ride back Andrew was cheerful and totally pumped about his Jeopardy! experience. I wish I could say I was so stoked, but back at the hotel the accumulated stress of the past month finally got to me and I developed a splitting headache. So I ate at the hotel restaurant instead of exploring town, took a bath (staining two facecloths with orange makeup) and went to bed. At breakfast the next day I ran into some of the other contestants who were going sightseeing together, which sounded lovely; unfortunately I was flying home that day and had to be at the airport before noon. So what did I take away from my Jeopardy! experience? The knowledge after the fact that I should’ve booked longer times down in NYC and especially Los Angeles than I did—hang the added expense!! The other competitors were lovely and interesting people and it would’ve been great fun kicking around with them more. From the GWN end of things, your friends all cheered for you, booed the competition and groaned at the US-centric categories (especially Final Jeopardy). And we were all proud that you got the GG question and pronounced “zed” properly. Yup, if nothing else I know how to pronounce zed properly! Glad that Alex chose the story about Jon… yes, he must have been so excited to hear his name being mentioned. I noticed they showed a quick shot of Johnny Gilbert during the story too! He is 88 years old now and still going strong ! These posts have been a wonderful read! And the show was lots of fun to watch — you did, indeed, look very composed. And although we did boo the competition, it was nonsense and not meant at all. They looked like lovely people, actually. Way to go Laura! Congrats for holding up the Canadian side and thanks for telling us about the whole experience. Epic. Thanks for such a compelling read!!! Still your write up made me feel like I was there! Congrats Laura!! I’m still amazed that you were on the show!! !